As we finish up another week of loud pops playing in which I sat next to the piccolo and in front of the percussion, I'm reminded once again of the auditory perils of orchestral playing. Let's back up though first, and review the process of hearing in itself (simplified). Sound waves travel to the outer ear (pinna), which then magnify the sounds and direct them inward through the auditory ( or ear) canal. At the end of the tunnel is the eardrum or tympanic membrane. The three bones of the middle ear, which I had to memorize at some point as the hammer, anvil, and stirrup, then convert the sounds from the eardrum into higher pressure sounds at the oval window, which is sort of like the exit. Simply put, the three bones of the middle ear (ossicles) are the malleus, incus, and stapes, and when they vibrate, they increase the vibrations to be perceived by the oval window, which is 30 (!) times smaller than the eardrum. Now back to musicians- sensorineural hearing loss is when the hair cells in the organ of Corti are damaged over time, either due to prolonged high volume sounds, short doses of high intensity sounds, etc. Next post will illustrate some of the frequencies of instruments, and why using earplugs is crucial in the orchestra (and non-orchestra) setting. A few years ago, the internet was abuzz with Janet Horvath, longtime musician health advocate, author of "Playing Less Hurt," and former cellist in the Minnesota symphony, and her battle with hearing damage from loud amplified concerts. ( hyperacusis: "an auditory injury caused by repeated exposure to high decibels or a single acoustic shock") Her story in the Atlantic is truly harrowing, especially after years of awareness and prevention on her part, but it is a true cautionary tale to all musicians. Let's look at hearing...by the numbers. dB (decibels) measure sound on a logarithmic scale, meaning that sound increases of 10 dB are actually an increase of the power of 10. (If you don't remember this portion of your high school mathematics curriculum, you are not alone). So what does this all mean? Well these are individual instrument readings, which means that if you are in the thick of an orchestra, small ensemble, new music ensemble, or band, the combined sounds can be more intense on a logarithmic scale. Loud shows with amplification can exceed volume beyond a typical classical concert as well, especially if you're playing onstage or close to speakers. Hearing loss can be short term or long term, and can take a few different forms. 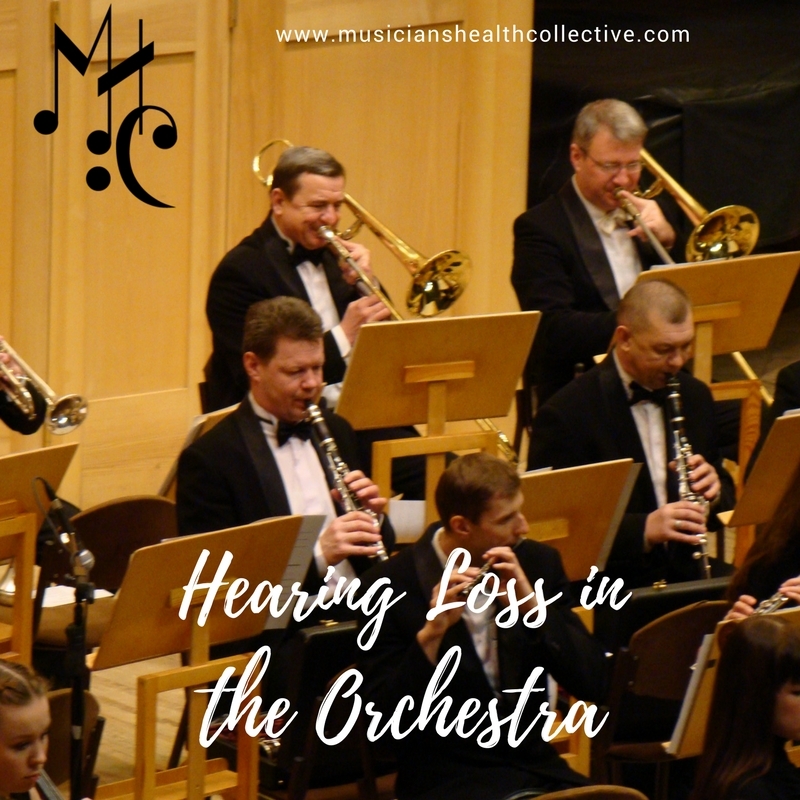 Many of us have had tinnitus (ringing in the ears), after sitting in an orchestra danger zone, which might go away after a few days or even hours. There is also sustained progressive hearing loss due to consistent exposure to high volume sounds. What makes this all even scarier is that when musicians are tested for hearing loss, especially in an orchestra, the numbers are relatively high. If you look up statistics for hearing loss in the symphony, the numbers range from 35% to 70%, depending on the questions asked, the year, the age of musician, etc. Even if it's on the low end of 35%, that's actually a rather high percentage for folks who need to make their living this way! The simple answer is to start using earplugs for musicians ASAP, and if nothing else, use foam earplugs. Most ensembles provide earplugs for free as part of the OSHA requirements, but it is definitely worth it to invest in a nicer set that doesn't block out all frequencies equally. Many of my colleagues use Etymotics, either as custom made earplugs or just the generic $12 ones. Both are an improvement upon foam earplugs. Many earplugs come with different filters/levels of sound diminishing, depending on what you need. Custom earplugs will often have the option to adjust to where you sit, what you play, and what clarity you need. Most professional orchestras will at least have these cheap foam earplugs, in order to comply with OSHA (occupational safety and hazard administration). This is what a custom set of earplugs might look like, running approximately $200. They aim to diminish the total volume of sound rather than muffle or distort pitch and speech. It is not usually the fault of these instrumentalists that their instruments are loud, or that composers ask them to play fortissimo and beyond (wagner, strauss...), and it is often your job to seek out shields or earplugs in those situations, and hope that the conductor will manage volumes when appropriate. In addition, it's important to be clear with management about the importance of shells for protection. Some of the orchestras I've played with did not provide protection, and while I often have my earplugs in my case, many others don't. If you are a sub or extra musician, always bring your own plugs. It can be stressful to tell personnel managers about the sound situation, especially if it's a high profile concert or conductor. Your long term hearing is more valuable than your ability to play fast passages in a Wagner overture, Mahler symphony, contemporary piece, or Pops show. If you can't hear yourself over the cacophony, chances are, your stand partner can't either, nor can the section leader or concertmaster. (Not to say that preparation is optional, but sometimes folks are afraid to use earplugs lest they play wrongly or out of tune). Prepare well and also experiment with knowing your own volume with and without earplugs so that you can start to be more comfortable using them. Many of my colleagues have found most success by using one earplug and leaving the other ear open directly next to the instrument, although there's certainly a case for mixing it up to prevent long term asymmetry. If you are a youth orchestra coach/leader/teacher, check out the situation in your class or ensemble. Many teenagers are not apt to worry about hearing loss, and your assistance could make a big difference. Also, avoid always use in-ear headphones, which are more damaging long term to your hearing depending on the frequency and volume of music/sound listened to. One last excellent point that my friend trombonist Chris Wolf pointed out to me, is that many musicians deal with something called the occlusion effect when earplugs are in, meaning that the sounds are perceived as booming, and difficult to perceive in context. Many of my friends who don't use earplugs say that they can't hear their section or intonation well, but just can hear their breath (especially wind players). It seems as though hearing specialists have addressed this issue in the context of hearing aids, but I wonder if it's something that audiologists are looking at for musicians, especially those who play wind instruments. If any of you have any experience with resolving this issue or know of a brand of earplug that addresses this, let me know! Give Your Ears A Rest and "4:33"
In the past, I've talked about high-decibel sounds and how they can damage your hearing permanently. Yet, what about the constant, frequent, medium volume man-made sounds that envelope our days? It's around this time of year that I notice how much sound I hear, mostly because of the constant holiday music, but what about everything else? Unless you have a sound-proof studio or practice room, you are surrounded by anthrophony, or man made sound in your soundscape of life. This includes language, music, mechanical sounds, and all the sounds that human inventions make: cars, car radio, air fan, trash pickup, etc. The opposite of anthrophony is biophony, or non-human sounds produced by natural organisms in their natural environment. When you go to a truly untouched place, whether it's a forest, lake, prarie, etc., there is a complete lack of human sound (anthrophony) and only biophony (bird calls, organisms,etc) and geophony (trees, wind, etc.). That's not to say that biophony is necessarily quieter in volume (hello rainforest parrots! ), but anthrophony is associated with stress, muscle tension, and disruption of homeostasis. In Bernie Krause' book, "The Great Animal Orchestra," he delves into the chaotic sound pollution that fills our days, and the impacts our noise has upon natural environments. One of the more distressing lines of the book is when he notes that many animals are deeply affected by human noise, "In the most severe case, where the noise exceeds a level of tolerance, many species of whales and seals will beach themselves and die." This is also true of domesticated animals, zoo animals, etc. If you've ever noticed a dog terrified by a firecracker or construction noise, you can see a small glimpse of the impact of anthrophony. In Katy Bowman's "Move Your DNA," she writes that "Distress in zoo animals has been associated with both the continuous unnaturally loud and frequent sounds they're exposed to as well as the absence of an environment's natural sounds-biophony." (149) My question is how are we impacting ourselves? First of all, I think John Cage was definitely onto something bigger with his work "4:33," especially nowadays. Notice how many sounds you ignore in your day-the sound of electricity, the heat fan, the click of your keys on your keyboard, the cell phone pings and rings, and maybe the din of constant music or sound. I've noticed that there are times when my ears just need a break from music, whether I'm walking or at the gym or in my car. There are times when my environment is loud and I just feel better wearing earplugs and introverting my attention. Most of the studies about human-produced sound and stress has been observing animals, habitats, and environmental change, but I believe that we are also impacting ourselves and our stress levels with the constant noise. You may know those white noise machines, or the new age recordings that feature geophony and biophony with recorded wave sounds, animal calls, rain, etc. Humans crave natural sounds too, and the constant input of mechanical sound can be very stressful and overwhelming. A study entitled "Decibel Hell" details some of the effects of this noise: the 50dB freeway sounds, the stereos of neighboring cars...can increase blood pressure, change breathing and affect sleep. You know this from when you spend the night in a noisy hotel or apartment, and you can't sleep. -Close your eyes right now, wherever you are, and notice the sounds in the space you're in. If the lights are on, you might hear the frequencies of electricity, and if the central heat is on, there might be a circulating fan. Notice that your ears and brain ignore these sounds most of the time. -Take a sound break. Whether you're driving, walking, taking the subway, or just at home, don't put the earphones in or turn the radio on, but just work in silence. (Or put in earplugs). Many people in larger cities now combat sound with sound by wearing headphones everywhere, which fights noise with louder noise. -Notice if you do better in quiet environments (whether you study, read, write, etc. ), or if you prefer a sonically busy environment like a coffee shop. Challenge yourself to be in a quiet environment, and notice if your body is hungry for stimulation and sound, or if you're able to adjust to the silence. -Think of a time when noise has increased your stress level, whether it was being honked at in traffic or at the airport or at work. The musique concrete folks of the 50's and 60's were definitely onto something with their recording of natural and unnatural sounds, whether they recorded it for music creation (R. Murray Schafer) or for manipulation and exploration (Stockhausen, Ligeti, Rautavaraa, and many many more). They all wanted us to start to notice the sounds around us, not just the music.